Hello, and happy Monday! Today, I’m reviewing The Sister Queens by Sophie Perinot. I first discovered Sophie Perinot when Michelle Moran (another favorite historical fiction author, and the gateway to many of my new discoveries for HF authors) posted in December 2015 about Sophie Perinot’s new book Medici’s Daughter. I went and read Medici’s Daughter… and was so happy with it that when Amazon helpfully suggested The Sister Queens as being by the same author, I bought it. It took me a little while to get around to reading it because that was about the same time as life picked up with moving us into our new house, but I have finally read it and am ready to review. Woot! The Sister Queens is a historical fiction novel set in 13th century France and England. This novel tells us the story of Marguerite and Eleanor of Provence, sisters who both married kings and became queens. Marguerite married King Louis IX of France and became Queen of France, while Eleanor married King Henry III of England and became Queen consort of England. Marguerite and Eleanor corresponded regularly and maintained a close friendship throughout their lives. They both lived through some major events and helped influence their spouses and their countries. 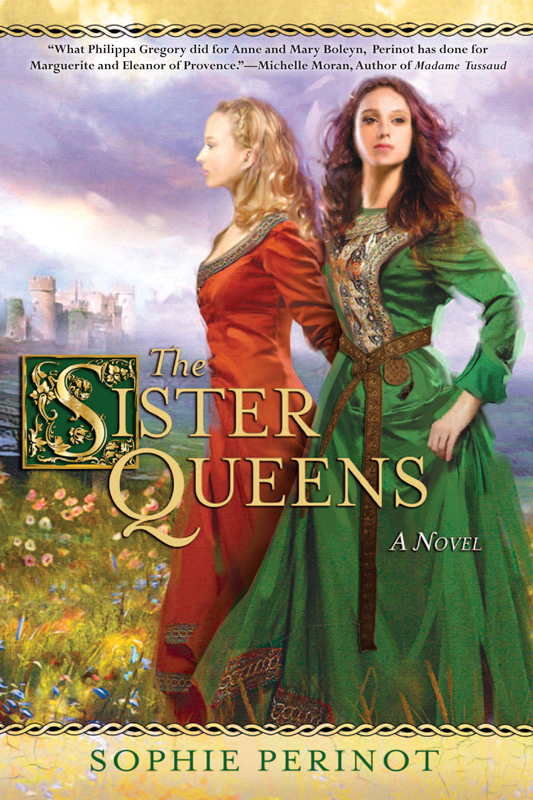 Full of romance, drama, adventure, danger, and political intrigue, The Sister Queens – based on a true story - is a fascinating tale of two sisters who had to navigate the murky waters of growing up, marriage, and politics. The Sister Queens is Perinot’s debut novel, and she did a great job, bringing us a captivating book. Perinot is a true artisan. She has done more than just write a novel. Using her words, she has woven a rich tapestry telling us the story of two women history does not often speak of. We ride with them the roller coaster of emotions on which life takes them. We feel the joy of births and triumphs, the fear of loved ones struck deathly ill and of danger on the Crusades, the heartache when death steals the souls of beloved family members, the anger of betrayal, the contentment of the security of the love of a good man, and so much more. I loved this book. I love reading historical fiction about women, and I especially love a well-done historical fiction about women I haven’t heard much about before, and The Sister Queens definitely fits that bill. Perinot does a good job walking the line between history and fiction and combining the two while staying true to the actual people, as well as making the characters come alive, making them 3-dimensional and complex. It all made me want to go learn more about both Eleanor and Marguerite, which is a win in my book (haha). I also enjoyed the Author’s Note at the end explaining some of the choices Perinot made in her story telling, and providing clarifications on things she changed or fabricated. I always love when a historical fiction author includes that info. As debut novels go, I’d put this up there at the top of my list of “Hit it out of the ballpark”. As far as the question of what to drink, I found that honeyed mead paired nicely with The Sister Queens. I’m not sure what the brand is, it’s one we bought from a vendor at a store, but it was yummy, and drinking mead with a book from 13th century Europe (while living in Europe, albeit modern day) felt like it lent an air of authenticity and immersion to the experience, and I am all about reading being immersive. You can find info on where to buy The Sister Queens here. Additionally, check out Sophie Perinot’s website and her Facebook page for some fun discussions. Last but certainly not least, check out the Facebook event for the online party celebrating the 6-month anniversary of Perinot’s historical fiction novel Medici’s Daughter. The party will be on June 1 but the fun has already started with announcements of special guests and giveaways. If you like historical fiction, you won’t want to miss this, she's got some great authors on board. And the week of June 1, check out Drink Read Love for our contributions to the festivities, including my review of Medici’s Daughter, a special Author Q&A with Sophie Perinot, and a special surprise post. Thanks for reading! If you've read The Sister Queens, which character is your favorite?